Hot dog! And, frankly, good food served amid a nostalgia-dedicated setting. 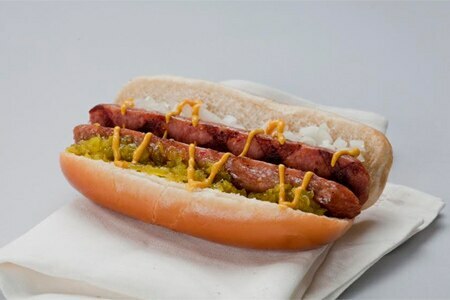 : Leave it to the owners of matchbox and Ted's Bulletin to come up with a restaurant that is all about hot dogs. If you are envisioning a little beachside pushcart, however, think again. With recipes created by a talented chef and the kitchen staff under his direction, what customers get are not just hot, greasy franks. You can indulge your inner-child's appetite with such dogs as the Cincinnati Coney, consisting of a Nathan's All Beef with Cincinnati-style chili, raw onions and shredded cheddar on a bun; or eat an oddity such as the Q's Seoul Bulgogi & Kimchi dog, with an Angus beef frank and marinated rib-eye bulgogi on a grilled loaf, topped with kimchi. You have 11 different wacky choices, but management challenges you to create your own hot dog supreme as well. And the small eatery is dedicated to nostalgia: everywhere are references to the DC-3, the Douglas Commercial 3, 1940s aircraft.